iCarhireinsurance's specilalist van hire excess insurance division has issued a warning that "Bank Holiday Van Hirers Warned They Risk Up To £1000 If Vehicle Damaged". The long bank holiday weekends are traditionally when many people carry out DIY jobs around the house. 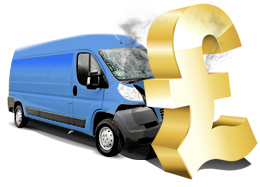 Research on the cost of van hire over the May bank holidays reveal that DIY enthusiasts and home movers could be out of pocket by up to £1000 if the vehicle gets damaged, even if it's not the driver's fault. With almost two-thirds )65%) of van hirers driving a van for the first time excess insurance is absolutely essential, but the good news is that drivers can save up to 50% buying excess waiver insurance in advance (see Table 1 below) and not from the van rentlal company. iCarhireinsurance.com, a leading supplier of van and car hire excess insurance protection, researched the costs of hiring an average sized van (Transit 280) in Manchester for the May bank holiday weekends (4-7 May and 25-28 May 2013) from three leading van hire companies, Europcar, National and Sixt. The rental cost was found to be similar form all providers at just over £100 for the four days, but the excess liability, i.e. the first part of any claim that the driver pays, ranged from £800 to £1000. Buying cover direct from the van rental companies to protect themselves from this expense could cost up to £66, or £16.50 a day, compared with a policy from iCarhireinsruance.com at only £7.99 a day (and £31.96 for the four day bank holiday weekend). Those drivers that believe that they do not need excess cover because they are good drivers may be interested to know that analysis of iCarhireinsurance.com 2013 claims has found that over a third (34%) of people that have claimed on their insurance for damage to a hire car or van said that the damage was "not their fault". Ernesto Suarez, from iCarhireinsurance.com continued: "With 65% of van hirers driving a van for the first time, and 34% of claimants stating that incidents were not their fault, excess insurance to protect them against the first part of any claim, which can be up to £1000, is absolutely essential. A scrape to the side of a van when loading decking can cost hundreds, if not thousands to fix."